Smart is a mobile application that uses the capabilities of a smartphone/tablet in web applications launched on desktops or mobile devices. The smartphone or tablet may serve as a camera, scanner or disk. SMART - quick to install, convenient to configure, smart in use! Download the Smart mobile app and install it on your phone. Pair the application with your system using a QR code shown on a screen. Use the smartphone's capabilities in the web application and on the tablet. Everything works together! You do not have to manually rewrite the phone number displayed on your computer to call the customer. You do not need to scan documents. You can conveniently edit the questionnaire or contract. You can instantly search for a document (invoice, order, policy) in your system. You can instantly enter data into electronic questionnaire of bank, insurance company, mechanical workshop, gas station, etc. You can store documents in electronic form instead of printing them. YOU CHOOSE A CUSTOMER'S PHONE NUMBER IN A WEB APPLICATION, AND YOUR PHONE AUTOMATICALLY CALLS HIM/HER You do not have to manually rewrite the phone number displayed on your computer to call the customer. YOU TAKE A PICTURE OF THE DOCUMENT WITH YOUR PHONE AND YOU CAN EDIT THE DOCUMENT ON YOUR COMPUTER STRAIGHT AWAY You do not need to scan documents. You can conveniently edit the questionnaire or contract. YOU SCAN A BAR CODE OR QR CODE WITH YOUR PHONE AND YOU IMMEDIATELY SEE THE OBJECT IN THE WEB APPLICATION You can instantly search for a document (invoice, order, policy) in your system. YOU SCAN A BAR CODE OR QR CODE WITH YOUR PHONE AND YOU CAN SEE THE QUESTIONNAIRE FIELDS FILLED WITH THE RELEVANT DATA IMMEDIATELY IN THE WEB APPLICATION You can instantly enter data into electronic questionnaire of bank, insurance company, mechanical workshop, gas station, etc. THE CUSTOMER SIGNS DOCUMENTS ON THE SCREEN OF YOUR PHONE/TABLET You can store documents in electronic form instead of printing them. SMART - a small app, and so many possibilities! 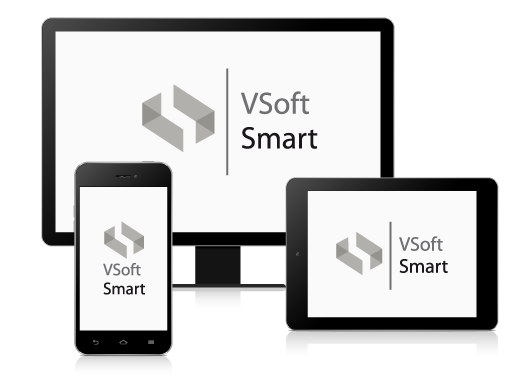 VSoft Smart is a product included in the innovative, integrated platform for the financial area – VSoft Financial Platform.